Use the Lime app to find the closest Lime-S to you. To unlock a Lime-S, simply scan the QR code located on the handlebars or the baseboard using the Lime app. You're ready to go! Wherever your Lime takes you, remember to obey traffic laws, to ride safely in the bike lane or street and to wear a helmet! 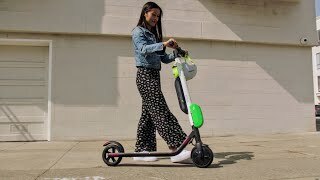 Ready to ride a Lime-S electric scooter? Review our instructional video, along with educational resources on proper parking, etiquette and FAQs to help keep your ride smooth and our streets unobstructed. How do I find a Lime-S near me? How do I unlock a Lime-S? To unlock a Lime-S scooter, simply open the Lime app and tap on the "Ride" button at the bottom of the screen. From here, either scan the QR code using your phone's camera or manually enter the 6-digit vehicle code located beneath the QR code. How much does Lime-S cost? Do I need a special license to ride Lime-S? No special license is required, but in some states a driver’s license is necessary to ride an electric assist scooter. Please consult your local DOT for specific information. How does Lime-S get charged? Our Lime-S electric scooters are monitored remotely by both local staff and an independent team of Lime Juicers. When a scooter is running low on power, our Juicers will pick it up, charge the battery and then redeploy the Lime-S out in the community. Can I become a Lime Juicer? Checking battery level is simple. Just tap the Lime-S icon within the app to view available battery life. How far can a Lime-S go on a single charge? Lime-S has a maximum range of 20+ miles, depending on usage. Are there speed regulations I should know about before riding Lime-S? Most cities have a maximum speed limit of 15mph. Lime-S's is just below that, at about 14.8 mph. Can Lime-S teach me how to moonwalk? Maybe, but it will cost you.